Beautiful Condo on the Marina, just steps to the beach!! 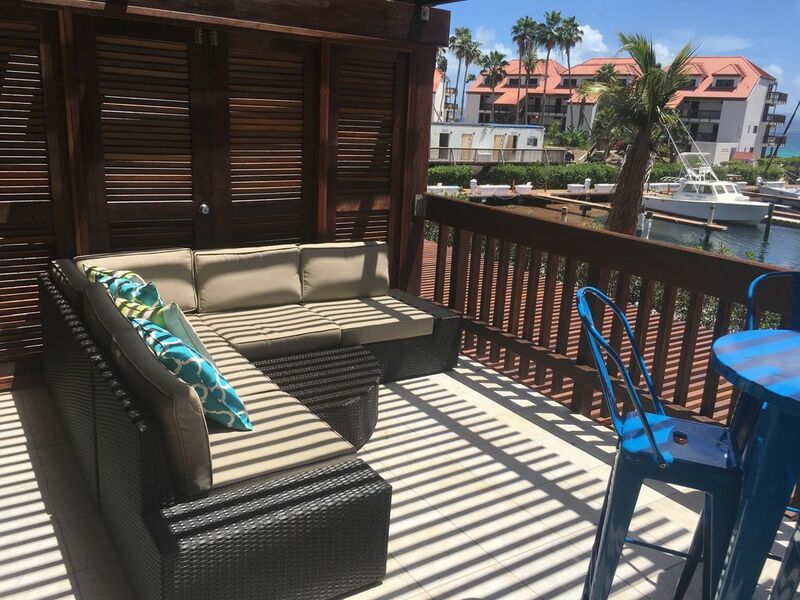 Start your day relaxing on the large balcony with your morning coffee overlooking the Marina, St. John, Tortola and the beautiful Caribbean waters. Enjoy the warm breeze blowing in your face. Then walk to the sandy beach looking out at the clear brilliant blue waters, you are truly in paradise! Take a swim in the sea, or at the pool, just steps from your condo. Go sight seeing, snorkeling, or water skiing, or just lie on the beach. Sapphire Beach is one of the most beautiful beaches in St. Thomas. Inside, you have all the comforts of a one bedroom apartment. The sleeping area can be enclosed by wooden partitions, leading into a comfortable living area with a full kitchen.Our unit is a corner unit with 2 sets of sliders and several windows to open up and just enjoy the breezes and views! The beach is steps away, but you get the best of all worlds. A marina view, beach view and an amazing view of the adjacent islands! We spent 2 weeks at this unit and had a great time. It was very clean and had a beautiful view of the marina and St John Island. Easy access to Sapphire Beach. I would recommend it. Has a new beach restaurant, and other restaurants in nearby Red Hook. Thank you Tom. I'm glad you had a good time and that our condo was accommodating for your stay. We hope you come back and visit again! Looking for a long weekend getaway, my girlfriend and I came to stay to get away from the middle of winter. This condo was every thing it needed for our needs: convenient to Red Hook and the restaurants and ferry's, a 2 second walk to the sapphire beach and beach bar and even closer to the marina where we caught a charter tour from the Breakaway boat. The Sapphire resort is fully open and 99% of all the construction has been completed. Meeting a few locals at the beach bar who were gracious enough to come pick us up over the next couple of days made our stay very inviting and got to see a lot of the island. Lee was very helpful in recommending places to go and gave us some great tips for where to eat and how to get around with the taxi's. Thank you again! Thank you for your review Terry. We're so glad you enjoyed your stay! The fact that you got to enjoy some local hospitality truly speaks to your kindness and character. Locals love gracious visitors! We hope come some and stay again. The condo smelled like mold, if you turned the AC unit on it filled an condensation pan and then the whole floor got a slick water film over all of it. No way to get rid of it but turn off the AC and prop the front and back doors open. If you wanted to run the AC at night you got to hear a constant drip, drip, drip. No exhaust fan in the bathroom to TRY to help the condensation! This is about my 15th trip to the island so when I contacted the owner, they informed me it was because of all of the moisture in the sea air. I'm not stupid, I've never had this problem anywhere I've stayed in St Thomas, St John, Water Island or Tortola. I wish I didn't have to give a star because one star it too high! Traci we do apologize for your BAD BAD BAD experience. You do realize that when you stay at a VRBO it is not a full service hotel and therefore 24 hour maintenance isn't available. During your phone call to me late at night I explained that every unit at Sapphire Beach Resort and Marina is equipped with a condensation pump to remove the moisture from the air. I said nothing about sea air, I stated high humidity. A well-traveled person like you would also know the most humid months in STT are October/November. On rare occasions the drain from the condensation pump clogs and may cause a slight leak onto the tile floor. This has happened to me at one of our other units (it is minimal water). Our COA maintenance people fixed it the very next day. We have owned this unit for over a year. We have never had another guest complain of an odor or of the slight noise the condensation pump makes when the A/C is running. In fact when you called that was your primary complaint. Your review also mentions nothing about our new patio furniture, our new sleep sofa, and brand new linens and towels. Neither does it mention how readily available we are and our responsiveness to your vrbo inquiries. Nonetheless thank you for your TWO night stay and one star review.